Lorain County is located in the middle of north central Ohio along the shores of Lake Erie, halfway between Cedar Point and downtown Cleveland. Industries such as shipbuilding, steel making, and fishing brought people, money and railroads to the area in the 1800’s. Now with a population of over 300,000 and an area of 492 square miles there is a lot of territory to cover. With unemployment hovering in the double digits Lorain County is hard pressed during these difficult economic times. The need for adequate housing and critical repairs for existing low income homeowners is a growing concern. 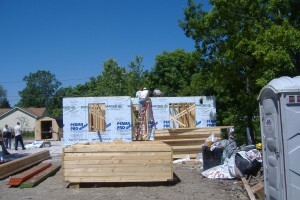 Lorain County Fuller Center for Housing’s long term goals are to build at least one new home per year while participating in the Greater Blessing Box program. Committee members for Family Selection, Family Partnering, Resource Development and Volunteer. Financial Support-Please mail donations to Lorain County Fuller Center for Housing, P.O. Box 284, Amherst, OH 44001.